The Beavercreek first baseman keeps her eye on the ball as she takes a throw from the pitcher for a forceout, during Wednesday’s July 11 Dayton South Softball League game at Coy Middle School in Beavercreek. Beavercreek won the game to finish the regular season undefeated. A Centerville infielder reacts after taking a wide throw, allowing Beavercreek’s no. 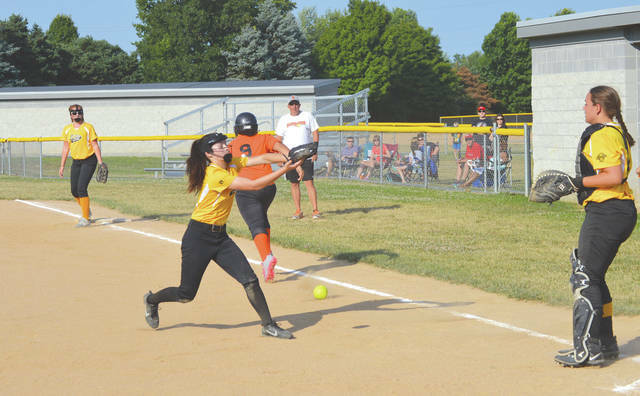 1 to steal second, in Wednesday’s South Dayton Softball League girls 14U fastpitch softball regular season finale at Coy Middle School in Beavercreek. Host Beavercreek won the game, 10-1. There’s a reason the Beavercreek 14U team #1 bunch finished the regular season with a 14-0-0 record: fundamentals. Here Beavercreek’s no. 8 scores standing up on a perfectly executed squeeze play bunt that left the Centerville pitcher flailing at air while trying to make the tag. Beavercreek used three pitchers against Centerville, and each one showed good control and strong arms. 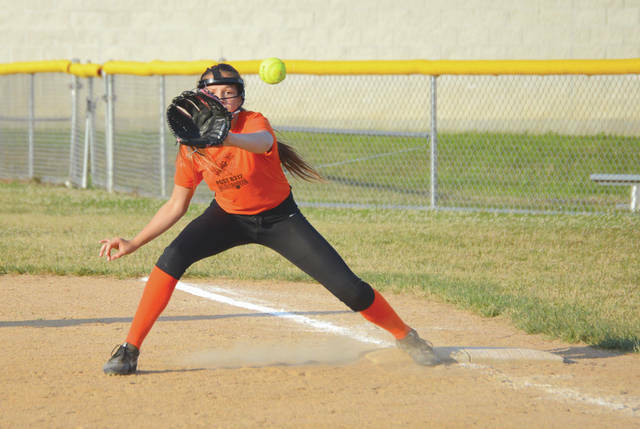 Beavercreek defeated Centerville, 10-1, to finish the South Dayton Softball League regular season with a 14-0-0 record. 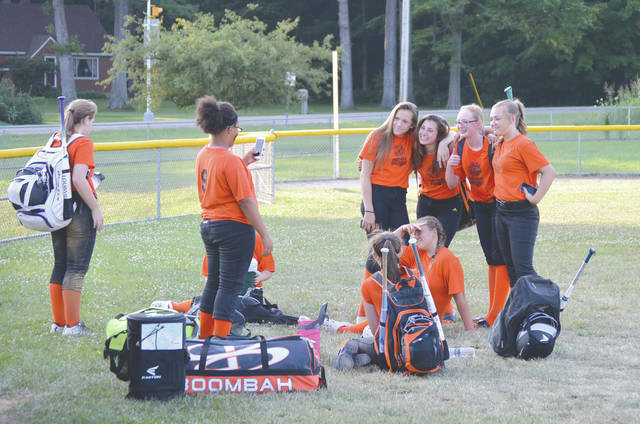 Members of the undefeated Beavercreek 14U team #1 squad celebrate by taking photos after Wednesday’s 10-1 win over Centerville, July 11 at Beavercreek’s Coy Middle School. The Beavercreek team showed solid fundamentals on defense, too, in Wednesday’s July 11 home win at Coy Middle School. Here the third baseman snares a foul ball for an out as the left fielder races in to back up the play. Centerville’s pitcher misses a shallow fly ball that was spinning away from her, down the first-base line. 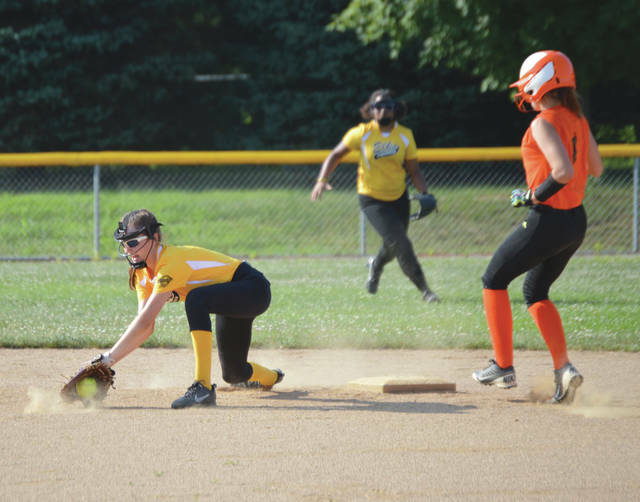 The Beavercreek player was safe on the play, July 11 at Coy Middle School. 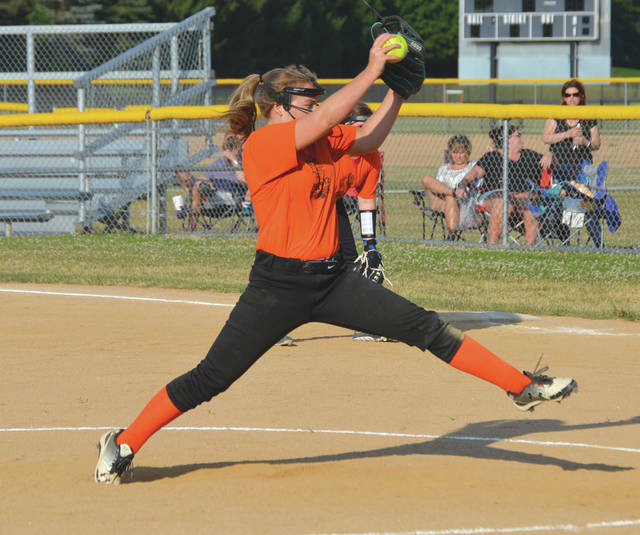 BEAVERCREEK — Using solid pitching, plenty of speed and excellent fundamentals on both sides of the ball, Beavercreek’s 14U team #1 made sure they weren’t going to finish second this year. 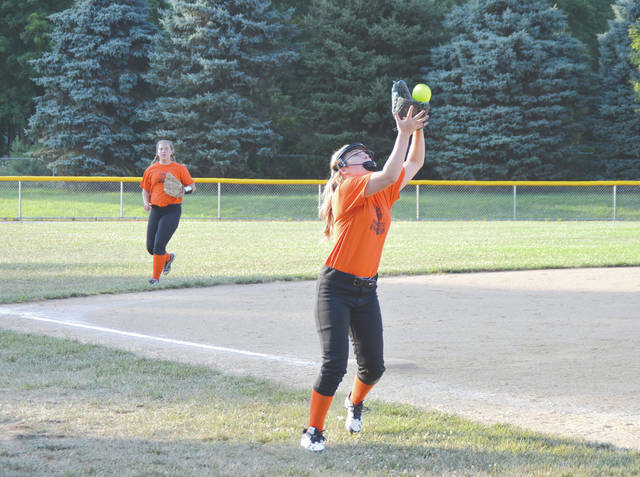 The VFW Post 8312-sponsored Beavercreek Fastpitch team appeared keenly aware that they were up against the same Centerville team that had edged them out of the 14U South Dayton Softball League title last season by one run. With Wednesday’s July 11 win by a 10-1 margin, Beavercreek made sure there wouldn’t be a loss to the Elks this time around. With the convincing win, the ‘Creek 14U #1 squad finished the regular season with an unblemished 14-0-0 record. Beavercreek plated a pair of runs in both the first and second innings to jump out to a 4-0 lead. 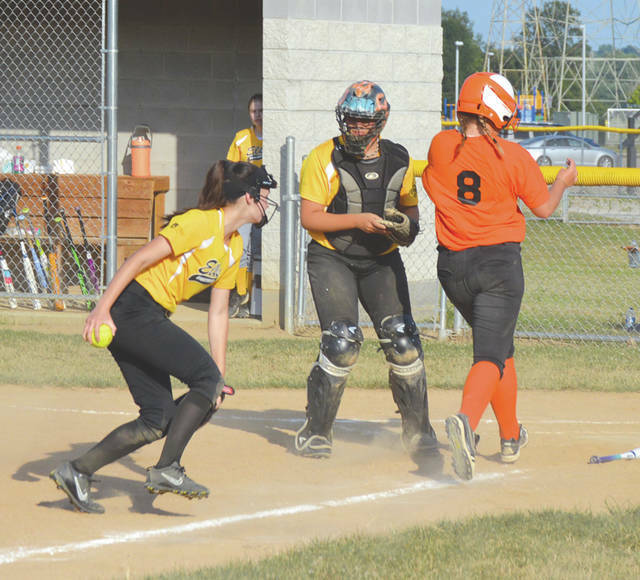 Team Orange exploded for four more runs in the third, and led 8-0 before Centerville could muster a base hit. Make that 10-0, before the Elks could get a hit. Beavercreek tacked on two more runs in the fourth inning for a 10-0 lead. Centerville finally put a batter on base in the top of the fifth. Their first batter to the plate drew a walk, advanced to third on a groundout and a wild pitch, then scored on the Elks’ only hit of the game, before Beavercreek retired the side. Centerville coach Ron Inman was proud of his players’ effort, but admitted they lost to a very good Beavercreek team. Burger said Beavercreek will earn a first-round bye in the post season tournament. They will open post season play Tuesday, July 17. The tournament is being hosted by Fairborn at Community Park. If the current regular season standings hold up, Burger’s Beavercreek #1 team will take on the winner of either Beavercreek #2 or Waynesville in the semifinal round, a game set for 6 p.m. July 17 on Community Park’s Field no. 1. Also if the standings hold true, Centerville and Miamisburg will play each other in the other Gold Bracket semifinal matchup. Their game would be on July 18, however. The tournament title game is scheduled to take place Thursday, July 19 at Community’s Field no. 1. “We’ve had a great year. Everybody’s playing hard, and we’re all giving it our best each time we take to the field. If we can grab a couple more wins in the postseason, it will be an even bigger year for this club,” Burger said.